The Days of Johann, an agility dog! : ID! All of us know how important having an identification tag is, right? And it's important to have your ID on all the time, even in the house or going out to 'do your business'. 'Cause you just never know what can happen - at any time, anywhere. I get very sad reading about stories of found pets with no identification. They have such a slim chance of getting back to their to their loves ones. And it could all be prevented with a little tag around the collar. 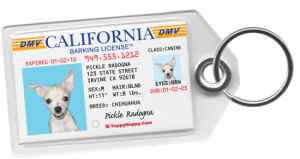 Any ID tag should include your human's name, address, telephone numbers (day and evening), your name and other important information, like your microchip number and date of your last rabies shot. There are lots and lot of different types of ID's - tags for your collar that come in the shape of bones, hearts, circles - you name it they've got it for us pups! You could even have your own personalized ID using a ID card printer, military style dog tags, diamond studded tags, even little driver's licenses - although they don't give you license behind the wheel. Just make sure you carry your ID at all time, K? pups? We want you to be safe out there!